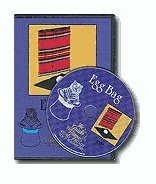 The classic magical effect, The Egg Bag, has never been explained as well as on this DVD, from the Greater Magic Video Library. Four top professional routines are performed. Martin Lewis shows and explains the Senor Mardo Egg Bag, Tom Mullica entertains with the Comedy Egg Bag, Billy McComb bedazzles you with his favorite routine using the Whiskey Egg Bag, and finally, the last segment is a lecture by Charlie Miller and Johnny Thompson the famous "Malini Egg Bag." Long a classic effect, but seldom performed, this DVD will instruct and teach how the novice or professional can add an excellent effect to their act. Excerpts from the Greater Magic Video Library, plus new material from Martin Lewis' great routine and explanation with the Senor Mardo Bag. This teach-in DVD, the third of the "Teach-in" series, spotlights another magic classic and gives an in-depth view of this popular effect.